Finding a cheap rental in Sydney’s heated market can be a tough ask—particularly if you need to be close to public transport. Thankfully, Flatmates.com.au have made the search a little easier by combining the Sydney train map with average room rentals within 1km of each station. Hurlstone Park was the cheapest station within 10km of the city to rent near according to the data with an average price of just $247 per week. Croydon and Dulwich Hill Stations rounded out the cheapest three at $248 and $256 per week, respectively. 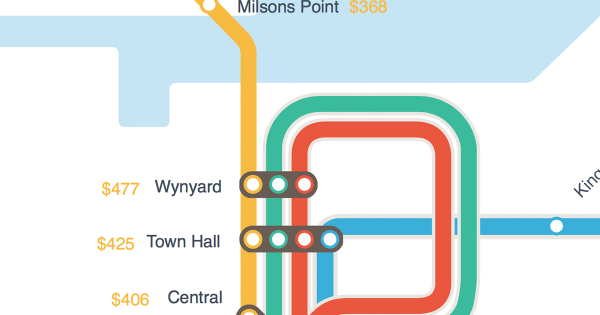 Overall, Circular Quay— not featured on the map— was the most expensive station to rent near with a whopping $547 per week average, while the cheapest was St Mary’s in Sydney’s West at just $150 per week.